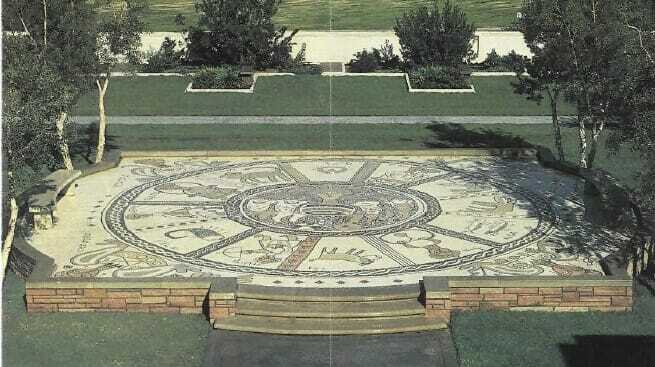 The Zodiac Mosaic was installed in 1974, is a faithful reproduction of the central portion of the 6th century Beth Alpha Synagogue floor (located in the Jezreal Valley of Israel). This mosaic recreation is five times as large as the original. The mosaic was originally installed as a cover and portal to Mount Sinai’s Genizah (storage area) where Hebrew prayer books and text are buried when they are no longer in usable condition. Starting from the steps (at 6 o’clock) and reading clockwise, the symbols of the Zodiac and the corresponding Hebrew months are as follows: Capricorn (Tishri), Sagittarius (Ellul), Scorpio (Ab), Libra (Tammuz), Virgo (Sivan), Leo (Iyar), Cancer (Nisan), Gemini (Adar), Tauras (Shebat), Aries (Tebeth), Pisces (Kislev), and Aquarius (Heshvan). AUTUMN (the Tishri cycle) lower right; SUMMER (the Tammuz cycle) lower left. The Zodiac is first mentioned in Jewish texts in the ancient Sefer Yezirah, where the names given the 12 signs are direct Hebrew translations of the Latin names. Some Jewish astrologers believe that the twelve signs of the Zodiac correspond to the Twelve Tribes of Israel. One rabbinical interpretation explains the signs in terms of Jewish History. Aries is the symbol of the sacrifice of Isaac, Taurus is connected with the calf which Abraham slaughtered for his angelic guests, and Gemini represents Jacob and Esau. The signs of the Zodiac figured prominently in early Jewish art, for example on the mosaic floors of ancient Palestinian synagogues as well as in prayer books and marriage certificates.